Travelling South on the A683, head back towards Lancaster. Just as you enter Hornby, there is a turning to your right, which takes you down towards the river, heading out towards Gressingham. You can safely park in the lay by once you’ve crossed the bridge. Once you’re parked up, head back across the bridge again, and turn left through the stile in the wall. The footpath takes you up a grass embankment, and straight into the bailey of the castle. The above photo shows a view of the castle looking North towards the modern causeway that leads into the bailey area. The banks here are about five to seven feet tall, and stretch from the West at the road side, to the ditch that runs around the base of the motte to the East. The ditch that can just be seen in front of the banks, is now only around two feet deep, but would most likely have been much deeper when the castle was in use. 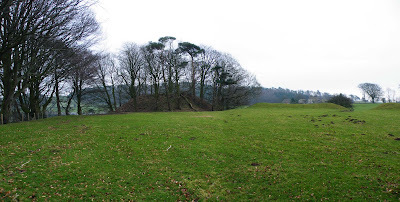 This is the largest and most intact motte and bailey in Lancashire. The site is widely regarded as the best preserved example of a motte and bailey castle in the county, and it’s easy to see why. This motte and bailey, built later than Melling, is only around two miles down river from Melling, and represents another Norman castle protecting the line of the River Lune. The above photo shows a view of the motte looking towards the West. The fields slope off drastically to the North (Right of the photo) down towards the River Lune, providing an effective defensive barrier. As you enter the bailey, which lays to the west side of the motte, you cross a recently added earthen causeway. The bailey is huge, estimated at around two and a quarter acres. This portion of the site is apparently built on the site of an iron age hill fort, and its position over looking a bend in the river, must have offered excellent defensive qualities. To the north and the west of the bailey, are well defined ditches and earthworks, marking the site out incredibly well. The photo above, shows a view of the bailey banks, looking North West. This photo demonstrates the height to which the banks still survive. The break in the bank to the right of the photo, is in fact the remains of the ditch that runs around the base of the motte. The motte, which stands some 15 metres tall, is surrounded by a ditch to all sides, except where it slopes off towards the river below it. The castle was built in the early days of the 12th century, but was abandoned some time later, possibly in the late 13th century, when the nearby castle in Hornby was built as a direct replacement by the Longuevillers family. The earthwork remains were put to use during the second world war, when a pill box was situated on the embankment over looking the road bridge. The photo above, shows a great view of the motte from the bailey banks looking East. The ditch around the base of the motte has survived to its greatest depth on the West side of the earthwork, inside the bailey area. The motte is very overgrown, with some well established trees growing from its sides. A great deal of work appears to have been done to the motte to stabilise it. It is pitted with rabbit holes, and therefore fenced off….however the foot path runs all the way round it affording excellent views. Another view of the motte (above) this time looking from within the bailey area towards the South. The fence on the left hand side of the photo, shows the Eastern boundary of the bailey. The above photo shows a good view of the motte from the far Western end of the bailey area. The motte, now tree lined, still stands a good twenty feet above the bailey. The bailey's defensive bank can just be seen towards the right of the motte. The site is easily accessible at all times and deserves a visit to see what a large motte and bailey castle would have looked like. Philip Davis' photos of the Lune Valley Norman castles are well worth a look.